Jorge Vago was born in 1962 in Buenos Aires, Argentina, but spent most of his childhood in Rosario, a large city on the banks of the Paraná river, moving back with his family to Buenos Aires in 1975. He divided his summer holidays between horseback riding on the family farm and surfing at Mar del Plata, on the South Atlantic coast. The Apollo missions to the Moon made such a strong impression on him that he envisaged a future career exploring exotic planetary surfaces. However, with no astronaut academy in the region, Jorge had to take a more pragmatic approach for his studies. He obtained a Bachelor degree in Engineering and an Electrical Engineering Degree at the Instituto Tecnológico de Buenos Aires (ITBA). In 1986, he moved to the United States to enrol in Cornell University where he completed a Masters of Engineering in Applied Physics and a Ph.D. in Space Plasmas and Planetary Physics. It was while at Cornell that Jorge became interested in ‘Origin of Life’ studies. Jorge came to the European Space Agency in 1992 as a Research Fellow, designing multi-point plasma turbulence analysis tools in support of the Cluster mission. He then worked for a few years as Systems Engineer, Project Manager, and later science coordinator on the development of physics experiments for microgravity platforms and the International Space Station (parabolic flights, Foton capsule experiments, Fluid Science Laboratory, etc.). In 2002, Jorge and a small group of ESA experts started to work on what would become the ExoMars Rover mission. This followed a recommendation of an ESA-convened team of scientists who proposed a rover mission equipped with a subsurface drill as the next step required to search for evidence of life on Mars. Today, the ExoMars programme includes two missions to the Red Planet in 2016 and 2018. Jorge is currently ESA’s ExoMars Project Scientist, serving as the interface for the scientific communities interested in the ExoMars programme. His role includes contributing to science and payload definition, and communicating the ExoMars scientific objectives at programmatic level. From this role, he also provides support for the preparation of future activities in the ESA-NASA Mars Exploration Programme, such as the Mars sample return mission. Besides work, Jorge also enjoys travelling with his family, painting, reading, music, swimming, and occasionally scuba diving and surfing. Jorge, why did you choose to work on the ExoMars Programme? I did not choose to work on the ExoMars programme because when I started there was no programme, or mission, or an ExoMars name for that matter. I belong to the ExoMars founding generation. In the beginning we were only three or four –then- young scientists and engineers. ExoMars grew from a number of studies carried out in ESA’s Concurrent Design Facility, which develops concepts for future missions. The first years were very intense because ExoMars was but one of tens of aspiring concepts competing for attention at a time when national agencies had cancelled most of their plans for Mars missions. 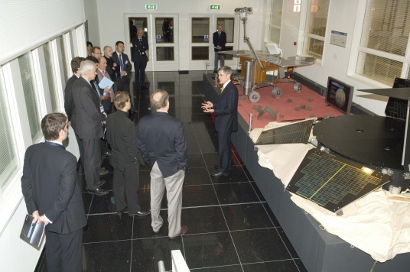 Right: ExoMars presentation to national delegates, November 2008. There are two things I enjoy most in my work; first, the opportunity to bring together some of the best experts in their fields in order to tackle challenging scientific questions. When the right chemistry is achieved, fantastic progress and amazing results can happen; secondly, the creative aspects of designing a mission, for example putting together the operational concept or finding ways to solve problems that may occur. What is it like working with an international team? Working in an international environment gives me a special buzz. People from different cultures and disciplines come together to work on a major project with a shared idea, but also with unique perspectives. Occasionally, this may lead to some friction, but my experience is that in the end a multicultural environment opens the mind to different ways of looking at issues. Besides, an international environment is good for parties, ensuring an interesting supply of culinary delights. What inspires you about Mars and the ExoMars Programme? A novel and interesting aspect of the ExoMars programme is the way that the ESA-NASA collaboration has come about. Historically, each agency has evolved its own approach to project development. As we started working together, we had to go through a process of convergence and adaptation that is still ongoing. I would describe the level of cooperation and good will as excellent. Since together we can achieve more, this is clearly the way to go for future, more ambitious missions, like Mars Sample Return. What is the big question about Mars you would like to see answered? Determining whether life ever existed, or is still active on Mars today, is one of the outstanding scientific questions of our time. The ExoMars programme seeks to address this important scientific goal and to demonstrate in-situ technologies, enabling both the mission’s science goals and the preparation of European participation in future endeavours. What is your vision or hope for the future of the mission? I believe it will be difficult to resolve the question of life on Mars with a single mission. However, my “realistic science hopes” for the ExoMars programme are twofold: 1) For the ExoMars Trace Gas Orbiter, to establish the origin, biological or geochemical, of the atmospheric methane; and 2) For the ExoMars Rover, to characterise, for the first time, the shallow subsurface environment, be able to find organic molecules, and provide a context for understanding better the Viking lander results. My dream for the ExoMars Rover mission would be to discover some credible evidence pointing to the past presence of life on early Mars.